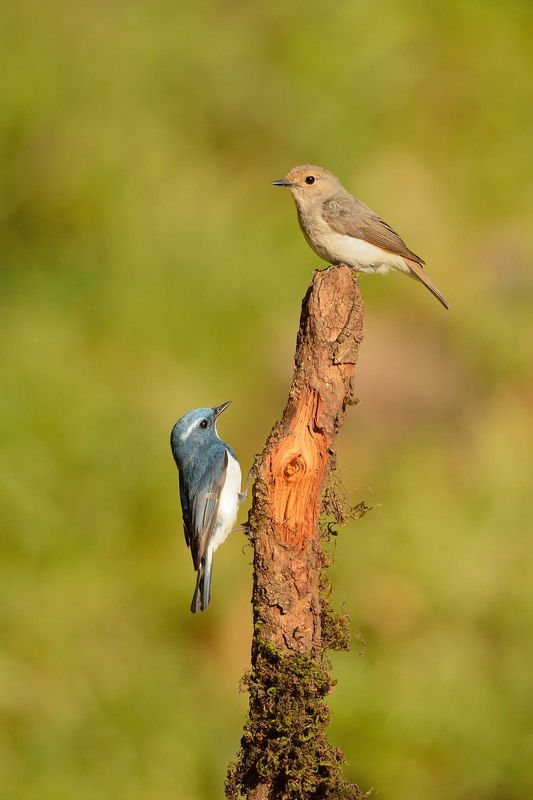 One of the sure-shot visitors to the Sattal studio is the Ultramarine Flycatcher (or the White-browed Blue Flycatcher). 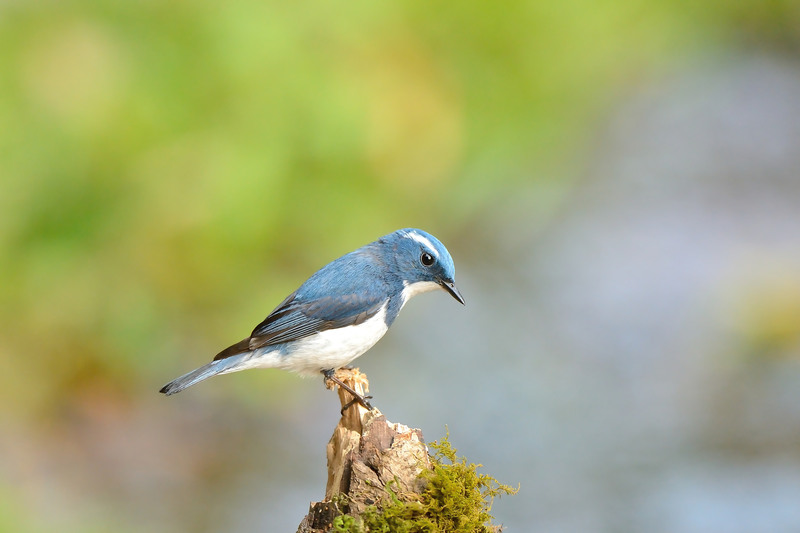 They are a summer breeding visitor to the Himalayas and breed between 1800 & 2700 m.
At around 10cm, the Ultramarine is slightly smaller than a sparrow. The male is deep blue above, sides of the head and neck are of a similar deep blue. A prominent white patch runs from the the centre of his throat through his breast to the belly. The western himalayan race (Ficedula superciliaris) has a distinct while brow (or supercilium) and a white base to the outer tail feathers. 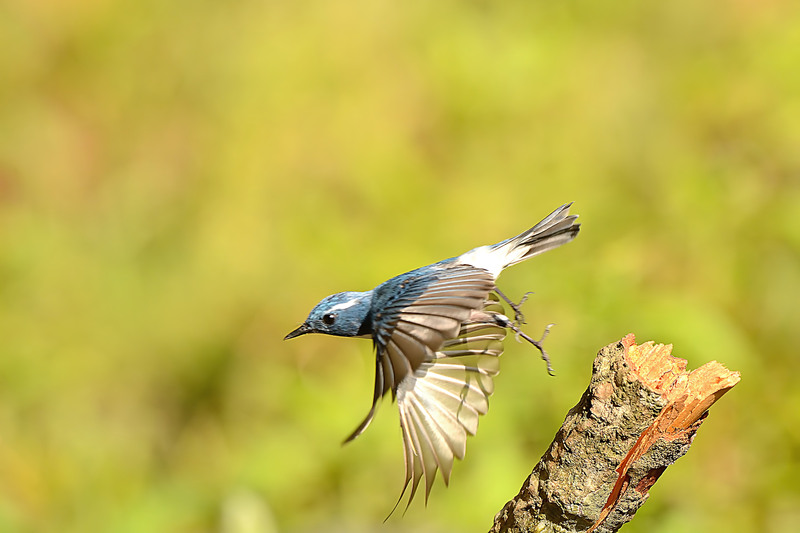 While I managed to get many portraits of this bird, the thought was to try and capture some action – something more distinctive. Considering how small this bird is, the best chance would be to try and focus on capturing a take-off. But this is really much easier said than done given how quick they are. The approach would be to focus on a perch, pre-decide the settings that would be needed and wait for the right moment. Of course, complicating matters was the fact that there were other birds that were popping out in different places while I was focussed on a specific perch. Several times, after waiting patiently for a while, I would give up – getting distracted by another opportunity on a different perch. And the Ultramarine would choose exactly this moment to land on the perch that I was originally focussed on. This went on for close to an hour. There were several times during this period where I would manage to hold my patience only to be that fraction late on the trigger – managing to get just a part of the bird or miss the jump completely. What made it tougher was the narrow field of view that I had with a 600mm lens on a crop-sensor body. This is a personal choice as I do not like cropping the images for composition – something is a fairly common practise. Finally, after what did seem like an eternity, I managed to get an image of the take-off. Not really as sharp as I would have liked but I had already made several compromises and still could not achieve a 1/4000th shutter speed that I needed – had bumped up the ISO to 800 (this was at 4:20pm and the light was really good), had slightly underexposed the image (to prevent the whites in the brow and the tail from getting burned as well as to try and bump up the shutter speed) and had closed down the aperture 1-stop to f/5.6 (would have ideally wanted to get to 7.1) so that I could get a slightly deeper depth-of-field to account for the uncertainty of the direction of the jump. All said, I was reasonably satisfied with the result – am now sure I will nail it the next time. While I was at this for about 90 minutes, I noticed that the female Ultramarine was also around. Usually these birds fly in pairs and this was not unusual. What all of us in the group wanted to try to do was to get both of them in the same frame. And that opportunity did come – but it meant that I had compose this image vertical. Initially, the male was much lower on the perch and I waited till he moved up into an ideal position in the frame before I clicked this. Reminds me of the illustrations of Shakespeare’s Romeo & Juliet.